The following photographs are a small selection taken from scrapbooks and albums donated to the Bishopthorpe Community Archive by Mrs. Cath Ostle. Mrs. Ostle taught at the Archbishop of York’s C. E. Junior School, from 1968 until her retirement in 1992. Starting in 1983, she decided to photograph the many visits and events that took place at the school and, in particular, with her own classes. During Cath’s time at the Bishopthorpe school, stimulating and adventurous projects were undertaken. 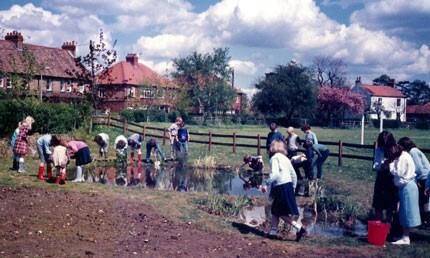 Amongst the most notable were the building of a swimming pool; a large pond dug to create a nature reserve; and the construction of a science and maths area. Numerous exciting visits took place: Edinburgh, Beamish, Chatsworth in Derbyshire and Robin Hood’s Bay, to name but a few. Cath snapped away with her camera recording all these activities. 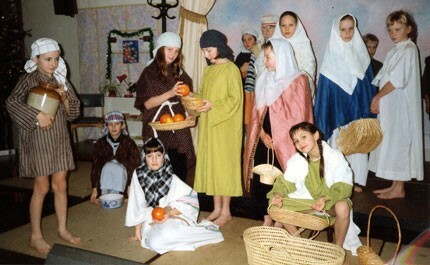 The resulting photographs reveal the happy children who passed through the school during this period and who will, no doubt, remember their school days with much affection. The collection of scrapbooks and albums can be seen at Bishopthorpe Community Archive in the Village Hall on Monday afternoons 2.30 – 5.00pm or else by appointment. If you have any memories or stories of your school days spent at the Archbishop of York’s School during this period, please contact us on the email address above. Mrs. Ostle was well-known for her hand-bell ringing groups. 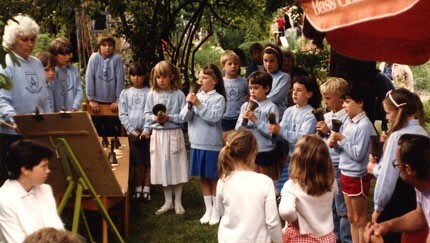 She is seen here on the left, guiding the ringers through a performance at the Copmanthorpe Festival in July 1986. 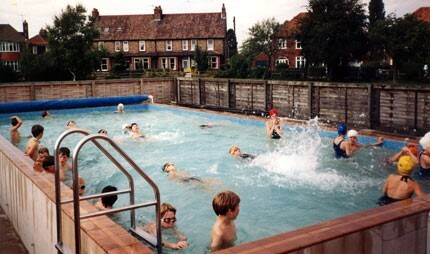 The school swimming pool was opened in 1971 when Mr. Alan Clementson was head teacher. Staff and parents raised the required funding (4,800GBP) over a three-year period. Cath took this photograph in September 1986. The houses in Copmanthorpe Lane can be seen in the background. 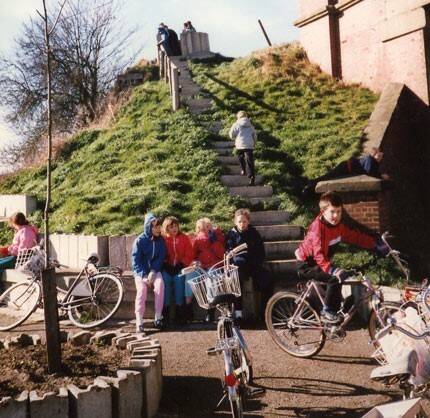 The children were often taken for bike rides using the new Cycle Path which skirts the village. 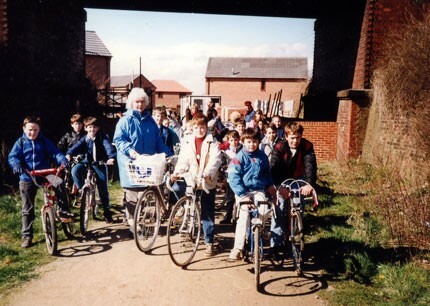 Officially opened in November 1987, the Path was built by Sustrans Ltd. on the old railway track running from York to Selby. The first photograph shows Cath and her class about to leave Bishopthorpe for Selby. Cath wrote that this was a very cold, blustery day in March 1989. 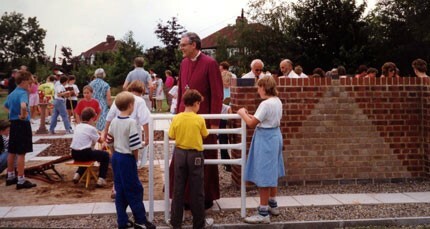 Archbishop Habgood is seen here on 16 July 1990 – the day he opened the highly-praised Maths and Science area in the grounds of the school. Dr. Habgood also unveiled a plaque in memory of former head teacher, Mr. Bill Matthews, who tragically died at Easter of the same year while training for the London Marathon. Mr. Matthews had drawn up the original plans for the area and it was thought a great shame that he was not there to see the fruits of his labour. The opening of the Maths and Science area coincided with the school winning a National Curriculum award; the maths and science area forming part of the school’s submission. 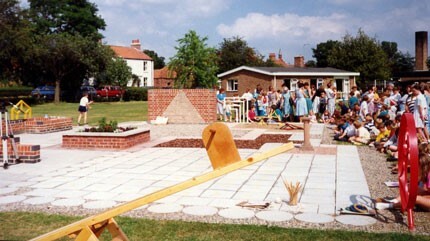 Parents, staff and children had helped construct the area. The equipment included a larger-than-life pair of scales and a pavement grid of counting squares which helped with measuring, counting and weighing skills.